COFDM full HD transmitter for UAV (KP-HD153P) is an exclusive design Mini H.264 HD wireless video transmitter with the 4th generation mobile communication core COFDM multi-carrier modulation technology,and high efficiency innovative H.264 compression code. 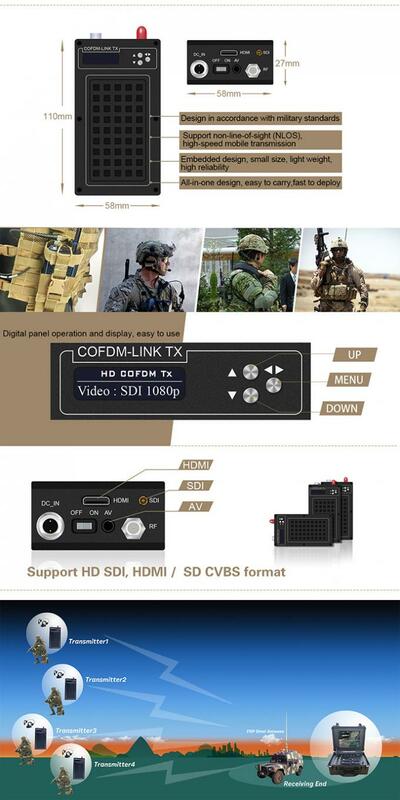 HD video audio monitor 50km COFDM wireless transmitter for UAV has strong light, low power consumption of OLED display control panel, integrated digital modulation, audio and video compression in combo. 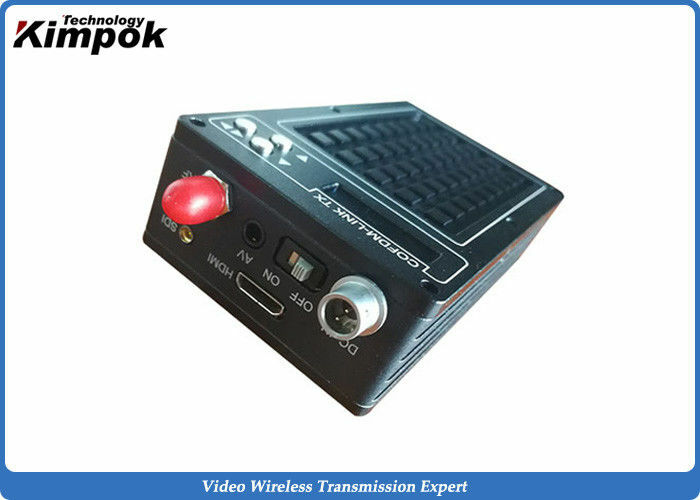 remote control aviation cofdm transmitter KP-HD153P is suitable for mobile image, HD video, and it perform well in NLOS digital video transmission. HD video audio monitor 50km COFDM wireless transmitter for UAV KP-HD153P is not only small& light, but also has a good performance.For example, it can transmit high quality full 1080P hd video and audio even though there are some building blocks or high-speed mobile shooting. It is widely used in UAV aviation filming,military,covert investigation,image monitor and real-time wireless video transmission. Strong interference: COFDM wireless transmitter is effectively against the multipath interference of signal waveform with the COFDM modulation. When the frequency selective fading occurs due to multipath transmission in the channel, only the subcarriers in the band depression and the signal carried by them are affected. The other subcarriers are not affected. Therefore, the overall bit error rate of the system is lower. Anti-multipath fading: COFDM wireless audio video transmitter is effectively against the interference with the multi-carrier technique (COFDM). Compared to the single carrier, multi-carrier inherently resistant to time delay and has strong multipath capability. With joint coding of subcarriers & frequency diversity of the channel, the system’s performance is improved. Therefore, COFDM wireless system is suitable for multi-path environment and fading channel high-speed audio video data transmission.